Prime Minister accuses Iran of orchestrating attack on an IDF patrol on Lebanese border Wednesday, in which 2 soldiers were killed. Iran was behind the attack on an IDF patrol on the Lebanese border Wednesday, Prime Minister Binyamin Netanyahu argued Thursday. Speaking at a memorial service for late Prime Minister Ariel Sharon, Netanyahu said that “Iran is the party that is arming, funding, and organizing the terror groups that operate on our border, in the north and the south." “This is the same Iran that is attempting to wrest a pacifist agreement on its nuclear program from the West,” Netanyahu noted. Nuclear negotiators of Iran and the P5+1 countries – Russia, China, France, Britain, the US, plus Germany – wrapped up their second round of talks concerning Tehran's nuclear program last week. They agreed to resume their discussions next month. The talks, chaired by EU official Helga Schmid, are being held with the hope of achieving further progress towards a long-term comprehensive solution on the nuclear issue. Under an interim deal, Iran's stock of fissile material has been diluted from 20 percent enriched uranium to five percent in exchange for limited sanctions relief. Speaking Thursday, Netanyahu urged world leaders to oppose a deal with Iran that allowed Tehran to continue its uranium enrichment program. “We must realize that the world is reaching one of the most crucial moments in history,” he said. “The question is whether the world signs a bad deal with Iran and turns its back on its responsibility, or whether it presents a united front to hold back the fanaticism of Islamic radicalism before it is too late." Two IDF soldiers, Major Yochai Kalangel and Sgt. Dor Nini, were killed Wednesday when Hezbollah fired anti-tank missiles at two IDF vehicles in the Har Dov area. 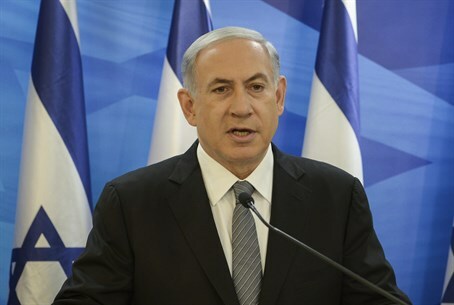 “Those who committed these acts will pay the full price for their actions,” Netanyahu said. “For a long time Iran has been using Hezbollah to establish a terror front against us on the Golan. We are aggressively acting to prevent this. "The government of Lebanon and the regime of Bashar al-Assad in Syria are responsible for attacks on Israel that emerge from their territory,” he added.